Many Science accumulated during September first fortnight, so we will be sharing articles little by little. 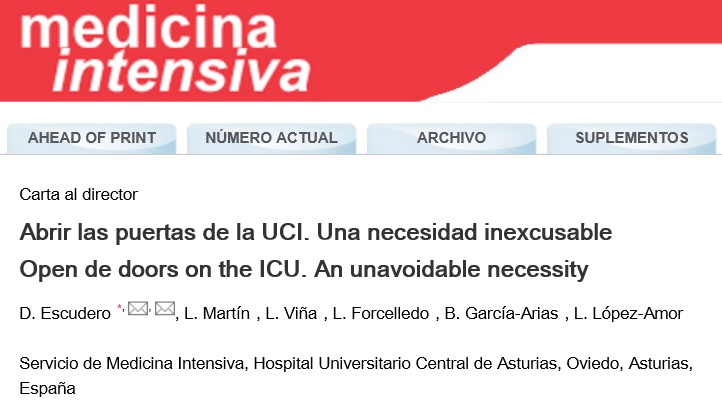 Our companions of the ICU of the Hospital Universitario Central de Asturias led by Dr. Dolores Escudero (IC-HU Project member) have recently published two very interesting articles. – Less than 4% are open 24 hours. – Nearly 70% continue with 2 visits per day. – Family participation in patient care: hygienic care 11%, feeding 80% and physiotherapy 17% . In summary: Spain continue with a policy of restriction and closed ICU, with little incorporation of family care and a design that does not provide the desirable comfort. Continuing with the same item, they have also published a letter to the Director in Medicina Intensiva: Open the doors on the ICU. An unavoidable necessity. Despite all the benefits of open ICU and the multiple recommendations that exist in the literature, we remain far from Sweden (70%). In 10 years since the research of José Manuel Velasco and colaborators, has passed virtually nothing and this should alarm us. It is clear that opening doors is not easy. How long should we wait? How many times have we knock on ICU door?